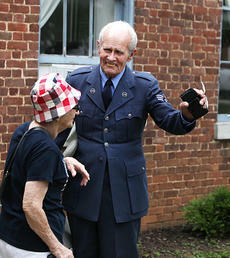 Elwood Squires waves as he speaks with those in attendance at the Memorial Day celebration Monday near the Taylor County War Memorial. Monday was Memorial Day, and I was fortunate enough to spend it covering the local celebration of the veterans who have served our nation and represented our community so honorably as they did so. As the event was winding down, I spoke with a gentleman who was dressed in full Air Force uniform, despite the fact that his service ended nearly 63 years ago. He was a pleasant man, I thanked him for his service and asked a few casual questions. Like many veterans, this man had stories to share, but none like I’d heard before. He proudly proclaimed that he could say something that perhaps nobody else who ever served in the military could claim; he went AWOL on his first day in service. Before you get the wrong idea, you need to hear the rest of the story, as Paul Harvey would have said. With the understanding that he would likely be drafted into the Marines soon, this young man decided to enlist in the U.S. Air Force. He was instructed to report to Louisville for a physical examination, and his understanding was that if he passed the exam, he would return home the next day. So he got in his pickup truck and made the trip to Louisville. “They run us through like a bunch of hogs,” he recalled of the process. Sure enough, the young man passed his exam and was ready to head home, but Uncle Sam had other ideas. A sergeant told the new enlistees they would be leaving the next morning, not for home, but for Texas. “We got to the end of the line, and there was a sergeant there with stripes from his shoulder down to his cuff, and they swore us in. He started reading us the riot act, and told us we would spend the night in Louisville at the Seelbach Hotel, and the next morning we would board a bus and go to Standiford Field and fly out to Texas,” he said. As it turned out, the young man had driven to Louisville alone and had no way of getting his pickup truck back to Green County. With that, the newly enlisted airman walked away with the sergeant shouting from behind. The young man got back home, spent the night, and the next morning, his brother drove him to Louisville to report to service. The young airman had to wonder just when he would catch the wrath of the sergeant, and that moment was fast approaching. That young man was Elwood Squires and most folks in Taylor County know who he is; he’s been here since Sunday, Dec. 9, 1955, which was the day after his final day in the U.S. Air Force. All these years later, he jokes that he never got enough money to get out of town, so he just stayed here. Folks, that was probably one of the best stories I’ve ever heard, and I’ll remember it for a long time to come. What I will also remember when I think of that story is the man, now 88 years old, who told it with such enthusiasm and pride in his service. All of our veterans have stories to share, and we should appreciate them and the service they have given for our freedoms, and we should share their stories with others. That’s why I wanted to share this story with you. If you know Mr. Squires and you see him out in town, be sure to say hello, but also, be sure to say thank you. Thank you, Mr. Squires, and all the other veterans who served our country, giving us the freedoms we enjoy, and unfortunately take for granted. Your service and dedication are appreciated.